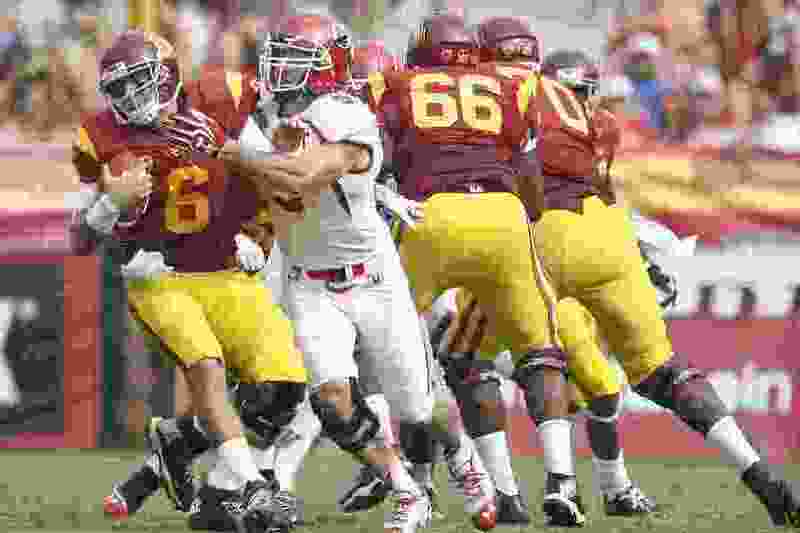 Chris Detrick | The Salt Lake Tribune Utah Utes defensive end Trevor Reilly (9) sacks USC Trojans quarterback Cody Kessler (6) during the first half game at the The Los Angeles Memorial Coliseum Saturday October 26, 2013. Trevor Reilly admires how the New England Patriots keep finding players who thrive in their system, after being rejected by other teams. He’s one of them. He also got replaced by one of them. Like everyone else in the organization, Reilly watched excitedly as James Harrison teamed with former BYU linebacker Kyle Van Noy for a sack that derailed Jacksonville’s last drive in the AFC championship game. 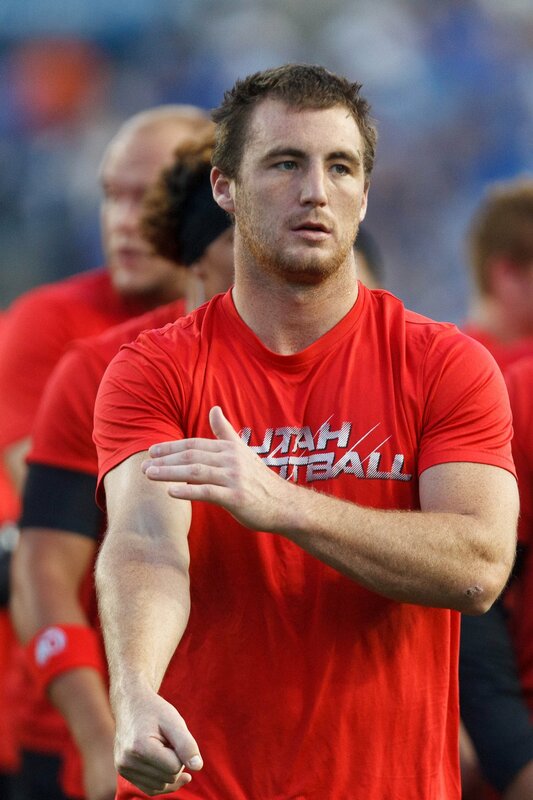 The former University of Utah linebacker’s happiness was tempered only slightly by the fact Harrison took his spot on the team. The Patriots released Reilly the day after Christmas, when they signed Harrison, a former All-Pro performer for Pittsburgh. Re-signed to the team’s practice squad, Reilly has joined in the Patriots’ preparation for Sunday’s Super Bowl LII in Minneapolis, but he won’t be on the field. “It stinks, not playing,” he said this week. He knows he played a role in New England’s run to another AFC East title in his two months as an active player, starting one game and playing regularly on defense and special teams. Yet merely watching the Super Bowl, not far from his mother’s childhood home, is a mixed blessing. That’s life for Reilly, a seventh-round draft pick who has spent four seasons in various roles for three AFC East teams: the New York Jets, New England and Miami. In one of his weird twists, he went from the Patriots’ practice squad to the Dolphins’ active roster in December 2016 — costing him a Super Bowl trip, although he experienced the playoffs with Miami. Reilly’s spot in Miami was created when the Dolphins released ex-Utah State linebacker Zach Vigil. More Utah-connected transactions would come this season. Reilly began the year on the Dolphins’ practice squad, then was cut in early October. The Patriots added him to their practice squad three days later. The next day, former BYU star Harvey Langi and his wife, Cassidy, were injured when a driver crashed into their vehicle from behind. Langi would be sidelined for the season with head and neck injuries; Reilly was promoted to the active roster to replace him. Trent Nelson | The Salt Lake Tribune Utah Utes defensive end Trevor Reilly (9) warms up pre-game as the BYU Cougars host the Utah Utes, college football Saturday, September 21, 2013 at LaVell Edwards Stadium in Provo. Reilly played well in November and December, but the Patriots couldn’t resist adding Harrison for their playoff run. Having turned 30, as a father of three children, Reilly will keep pursuing the NFL — somewhere. He recently bought a home in Lehi, after basing his family in Miami last year. His wife and children came to Utah when he went to New England. Reilly’s giveaways after his last play in college made him even more memorable at Utah. After his interception preserved a win over Colorado in 2013, he fired the football into the South End Zone stands, then came to the sideline and tossed his helmet a few rows into the student section. Ute coach Kyle Whittingham was none too happy with those gestures, but he could only appreciate Reilly’s four-year contribution to the program. Patriots cornerback Eric Rowe, a Ute teammate for three years, has enjoyed being around him for parts of these two seasons in New England. Rowe says Reilly is the same person as ever, a tough guy who’s also “really intellectual,” enjoying deep, philosophical conversations. Reilly hopes to be doing that somewhere in the NFL next season. His employer, as usual, is to be determined.